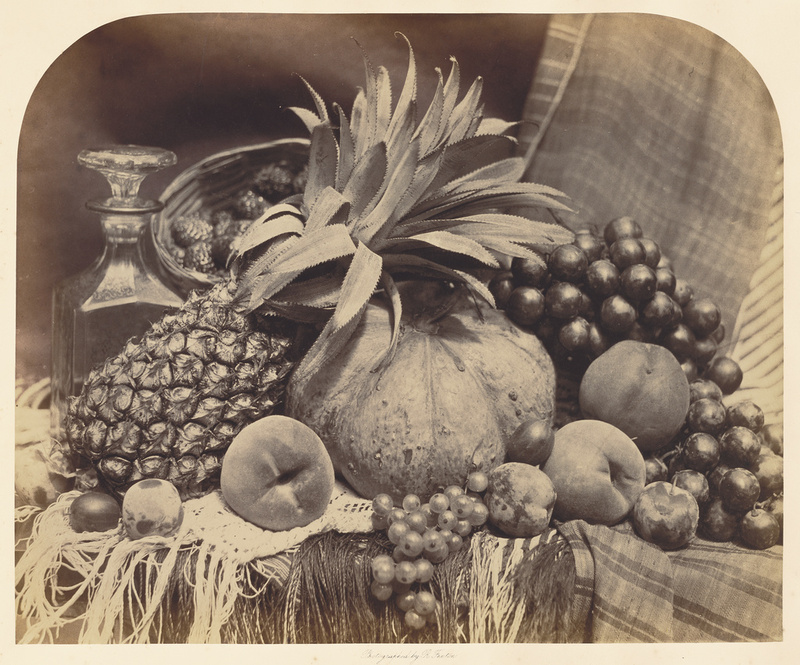 Roger Fenton began to make still lifes of fruits and flowers toward the end of his brief photographic career. Unlike his earlier, more documentary work, the still lifes were Fenton's conscious effort to align the medium of photography with the more traditional art form of painting. This composition shows a bounty of edibles displayed against the rich textures of fringed lace and plaid shawls. The spiky stems of the pineapple push forward in the frame, begging to be plucked to expose the sweet ripeness inside. A glass decanter, its mouth and stopper subtly echoing the plump curves of the velvety peaches, glistening grapes, and succulent squash, refers slyly to wine, that most intoxicating fruit of fruits. Lesson in which students learn about still life paintings and write a detailed description of a still life. In this lesson students learn about and discuss the basic shapes used in artistic compositions.